Gardaí have condemned as a "reckless attack" a shooting that took place outside a west Dublin school on Tuesday afternoon. A gunman fired shots from a handgun at two men outside Riversdale Community College in Blanchardstown at around 3.40pm. They were waiting outside the school to collect the younger brother of one of the men. No one was injured in the attack and the gunman ran off in the direction of the Corduff estate. Gardaí said a number of people were arrested at the scene but released after searches. Gardaí from Blanchardstown have this evening carried out a number of searches in the Corduff area, assisted by the Emergency Response Unit and Armed Support Units. No further arrests were made. Gardaí condemned the "reckless attack which took place in broad daylight" at a time when school was just about to finish, and students would have been coming out to be collected by parents. They an appeal to any person in the vicinity of the school between 3pm and 3.40pm to contact the station. In particular, gardaí are looking for any person who was driving along Blanchardstown Road North or Corduff Grove who may have dashcam footage to make contact. Anyone who observed any unusual activity near the school in recent days are also being asked to make contact with Blanchardstown Garda Station on 01-6669700, via the Garda Confidential Line on 1800 666 111 or through any garda station. Gardaí believe the attack is the latest in a series of feud-related shootings in west Dublin in the past four months. 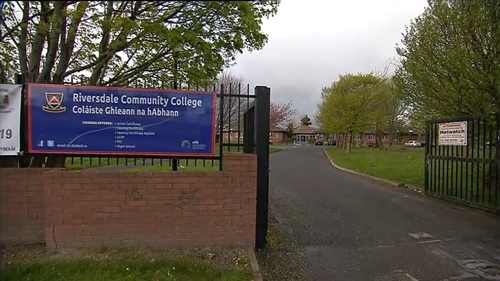 Dublin and Dún Laoghaire Education and Training Board (DDLETB), which is the patron of Riversdale Community College, released a statement after the incident. "The gardaí attended the area immediately in large numbers. All pupils and staff are safe and well," it said. "When the nature of the incident became apparent, the school requested all pupils to stay within the school for a period of time to ensure their safety and wellbeing. The school also contacted parents and in due course all pupils were able to leave as normal. "The school will reopen tomorrow fully as normal." It said psychological support services would be available to students and staff if necessary. The education and training board also expressed its "strong appreciation" to the entire school community and commended the principal of the school, all staff, pupils and parents for "the excellent and calm manner in which they reacted to this regrettable incident". Gardaí say there has been an escalation in gun and drugs crime in west Dublin, with ongoing feuds in Corduff and in the greater Finglas and Blanchardstown areas. Local gangs have fired shots at each other on the streets. One man, Lee Boylan, was shot and seriously injured in his van last month and another man, Eric Fowler, was shot dead three days before Christmas. Garda patrols have been increased in the area and several firearms have been seized in the operation.